Earthshine effect can be seen along with few stars. Look closer at those tiny gems sparkling along the moon’s edge near to Tycho crater. Each is either a mountain peak or the top of a crater catching the first rays of the sun light. Don’t mistake it as a star! 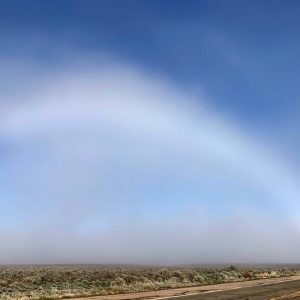 View the photo above larger – and get details – at EarthSky Community Photos. February 6, 7 and 8, 2019 present a grand time to go young moon hunting. 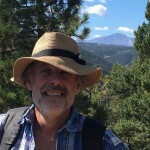 At new moon on February 4, 2019, the moon was lost in the sun’s glare all day long, so it was invisible in our sky at that time. But now that the moon has moved a touch east of the setting sun, as seen from Earth, the moon is out for a brief while in the western sky after sundown. In the coming evenings – as the moon moves toward the east in its orbit – it’ll appear higher in the west after sunset each day. 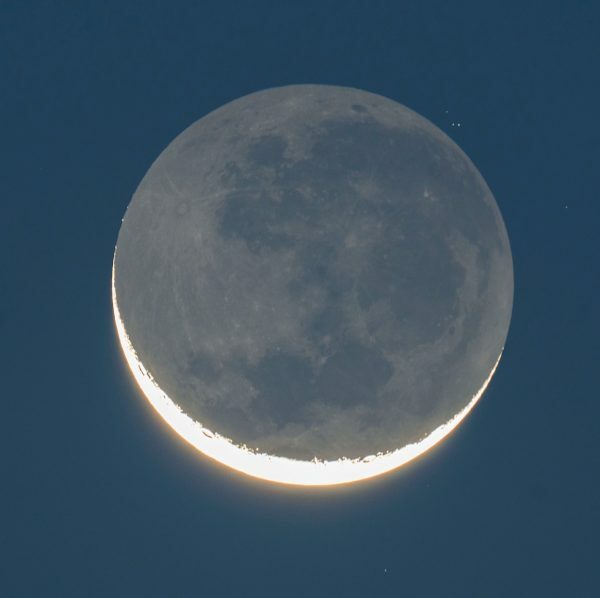 Watch for earthshine to softly illuminate the dark side of the lunar crescent, as beautifully displayed in the photo above. From February 6 to 8, 2019, you’ll find a waxing crescent moon in the west after sunset. Be forewarned. Especially on the evening of February 6, the young moon may be hard to catch, because the whisker-thin crescent sits low in the western sky at sunset and then follows the sun beneath the horizon before it gets good and dark. Presuming an unobstructed horizon and clear sky, however, most places worldwide have a reasonably good chance at spotting the young moon near the sunset point on the horizon an hour or so after sunset on February 6. Want to know when the sun and moon set in your sky? Click here if you live in the U.S. or Canada, or click here for virtually anyplace worldwide (but remember to check the moonrise and moonset box). Binoculars always come in handy for any young moon search. The sky can appear quite murky or hazy near the horizon because of the greater thickness of atmosphere. Plus the evening twilight tends to bleach out the already pale and ghostly-looking lunar crescent. On the other hand, if you’re blessed with a crystal-clear sky, you should have no trouble seeing the lunar crescent with your eyes alone. Moon’s orbit around Earth, seen from above (north of the ecliptic). The yellow arrows indicate the direction of incoming sunlight. The moon is now in a waxing crescent phase, between new moon and first quarter. 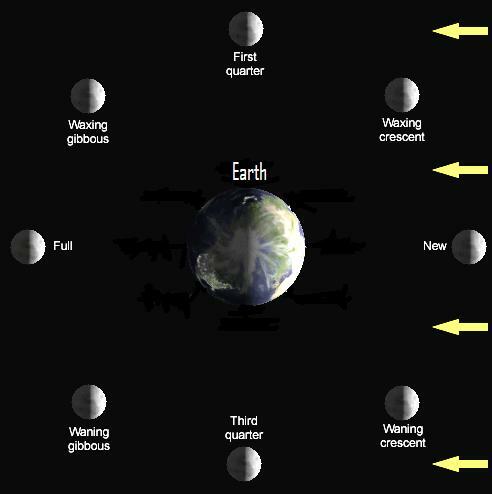 Read more: 4 keys to understanding moon phases. Each day, at the same time, note that the moon appears more upward from the horizon. This daily change happens because the moon in its orbit is moving eastward, away from the sunset direction. When the moon finally reaches its first quarter phase on February 12, 2019, then the sun, our planet Earth and the moon will be making a right angle in space, with the Earth at the vertex of this angle. At the time of first quarter moon, the wider angle between the moon and sun prompts the moon to stay out until late night, or around the midnight hour! At present, the sun-Earth-moon angle is very acute (small), so the thin waxing crescent sets soon after sunset. 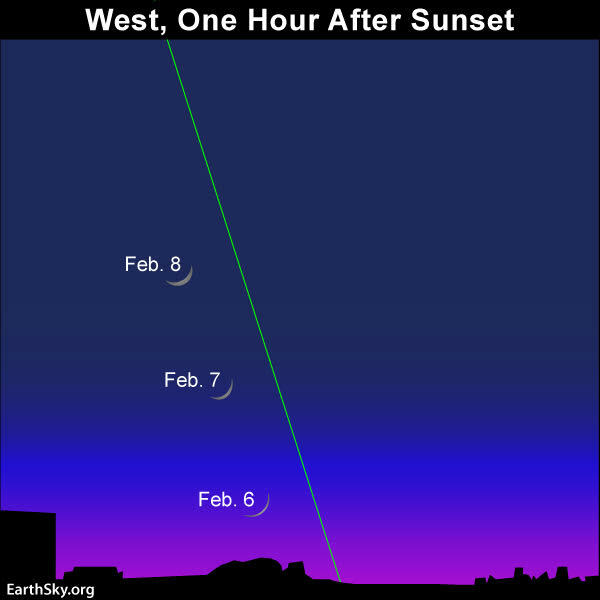 If you miss the lunar crescent after sunset February 6, try again on February 7 and 8. Day by day, the moon will appear higher up at sundown, and the moon will display a wider crescent that’ll set later after dark. When you look at a crescent moon shortly after sunset, you can sometimes see not only the bright crescent of the moon, but also the dark part of the moon’s disk. That pale glow illuminating the nighttime part of a crescent moon is actually twice-reflected sunlight – sunlight reflected from Earth to the moon, and then from the moon back to Earth. It’s called earthshine. View larger. | The dry Atacama Desert might seem like an odd place for the moon to take a dip, but – in this intriguing image, taken by ESO Photo Ambassador Petr Horálek – it appears to do just that. 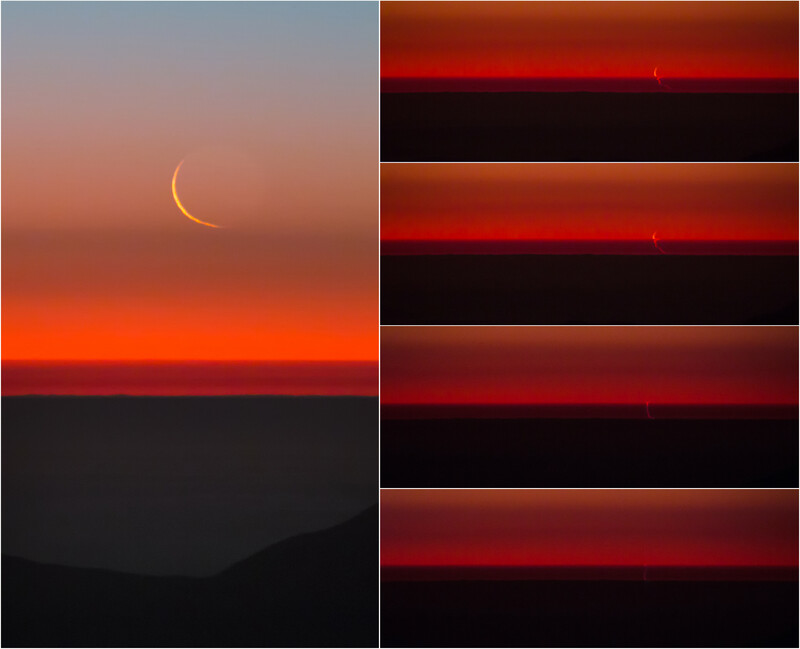 Initially high, the crescent moon slowly descends through the clear Chilean sky, before hitting the thickest parts of the atmosphere right above the horizon. Image via European Southern Observatory. Bottom line: Bring the kids along with you, for their young eyes may well catch the thin lunar crescent in the western twilight dusk on February 6, 7 and 8, 2019!